Explorer's Reef takes guests to the world below the waves, where you can interact with hundreds of different marine species. The following content is created in consultation with the San Diego Tourism Authority and SeaWorld® San Diego. It does not reflect the work or opinions of NBC Los Angeles's editorial staff. To learn more, visit Sandiego.org. From exciting rides to wet and wild shows, SeaWorld® San Diego has always treated its guests to an immersive, one-of-a-kind experience. But the educational park has truly outdone themselves with their latest "hands-in" attraction. 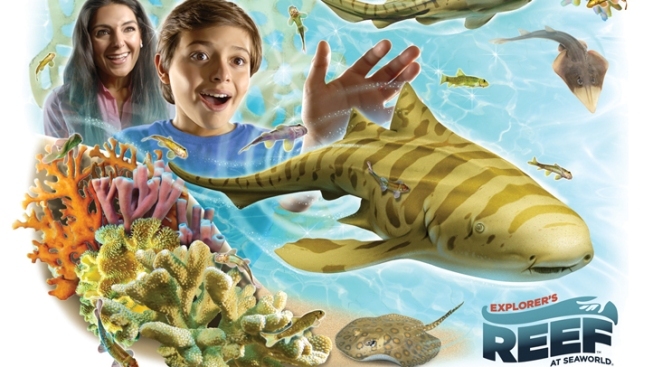 To kick off their 50th Anniversary, SeaWorld® San Diego introduces Explorer's Reef, a vibrant new experience that immerses guests in an underwater world and puts them up close and personal with a stunning variety of ocean species. As soon as guests set foot inside Explorer's Reef, they are immediately transported into an underwater world. Walk under a wave sculpture to enter a tropical coral reef that gives the feeling of walking on the bottom of the ocean. But the real attraction is the state-of-the-art touch pools. Holding more than 26,000 gallons of water and home to myriad marine life, touch pools give guests their first chance to experience the beauty and wonder of incredible marine animals through up-close interactions with shark pups, rays, crabs and cleaner fish. In addition to educating and entertaining the public, a chief initiative of SeaWorld® San Diego has always been its Rescue Program, which helps rescue, rehabilitate and return animals to the wild, giving them a second chance at life. Stranded marine mammals such as seals, sea lions, sea otters, dolphins, whales, sea turtles and seabirds are nursed back to health and, whenever possible, returned to the wild. Over five decades, SeaWorld® San Diego has rescued more than 15,000 animals and has treated as many as 475 marine mammals in one year. To plan your next visit to SeaWorld® San Diego, visit Sandiego.org/seaworld.